The Innovation Pointe campus in Stillwater, Okla., is an innovation district that provides the resources to make businesses successful. It all began in 2016 when Central Electric Cooperative, an electric distribution cooperative that serves more than 20,000 meters in seven central Oklahoma counties, constructed a new headquarters with the vision of drawing more renewable energy companies this new business park. The cooperative envisioned campus signage that would make a statement and give them flexibility in messaging, so they turned to MetroSign Corporation of Oklahoma City. Central broadcasts a wide variety of messages on the new signs, including safety promotions, community events and help wanted information. 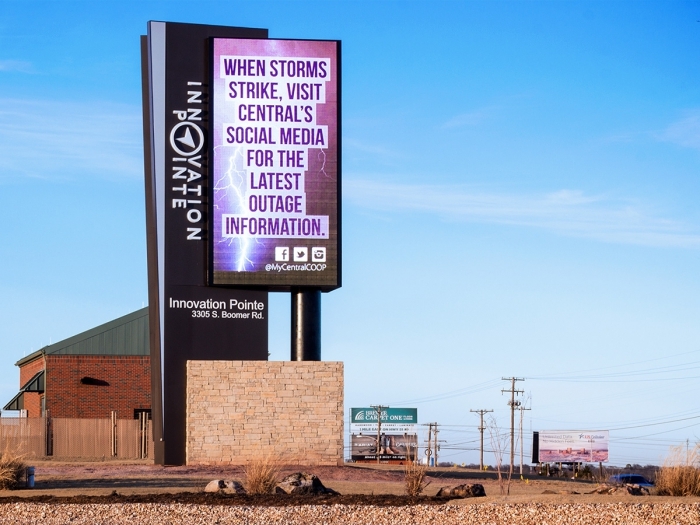 “Three-quarters of our members live within a 25 mile radius of Innovation Pointe, and our location on a major route into Stillwater provides these messages with a lot of exposure to our members,” said Mattox. In fact, since turning on the new sign in the fall of 2017, Central has been able to cut back on some newspaper advertising.